Niles Cassidy, the unlikely hero. 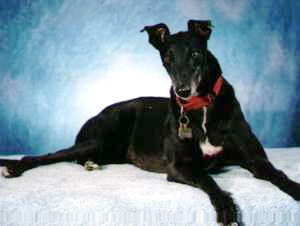 My retired racer, Niles, is an unlikely candidate for the title of Hero Dog. He is so very mellow that he doesn’t appear to be paying much attention to the world around him. When a semi-truck driver tried to turn his rig around in my circle driveway, the truck’s axle got hung up on a landscaping boulder and the only way off was through my dance studio. Niles incessant barking woke me and with his intimidating presence and a little help from the police, the driver’s hit and run plan was foiled. Our family has grown to three dogs and one human, so walking in the park takes a little more vigilance and dexterity on my part. I keep a wary eye out for dogs off lead, and try to avoid them if possible. On one morning walk, though, we encountered an aggressive, leashless Lab. He approached us with his hackles raised, barking and snapping. Both of my females pulled to the ends of their leads. I planted my feet and prepared for a nasty fight, afraid that one or maybe all of us were going to be hurt. I tried yelling “No” several times, in my loudest most commanding voice, but the Lab kept coming. Niles stood quietly at heel, until the Lab was about six feet from us. Then he sprang into action: leaping, growling, showing his teeth. The Lab dropped to the ground like someone had let the air out of him, then tucked his tail and went yelping back to his irresponsible owner. We finished our walk with Niles strutting jauntily in front of his three proud females. On the second occasion, the greyhounds were asleep in the yard while my Scottish terrorist, Quincy, was chasing bugs and birds and anything else that moved. Suddenly Niles began to bark the high-pitched, “something is wrong” alarm. I ran to the yard and saw the reason for Niles’ barking. There was Quincy on the wrong side of the fence, heading at a trot toward the busy highway in front of our house. The diet I’ve had her on must be having an effect, because somehow she’d squeezed that fat little body under the closed and locked gate. I yelled, “Quincy, wait!” and to her credit and my amazement, she stopped and waited for me. I scooped her up and carried her back to the yard, where Niles waited, grinning and wagging his tail. He knew that he’d done a good job. Niles may be retired from racing but he’s taken on a new position in our little family. Niles is our Career Hero Dog.